Although the Rosette nebula is not very bright - it is much too faint to see with the naked eye - it is famous mainly because it is a striking circular shape resembling a flower. The Rosette nebula is in the Perseus Arm of the Galaxy and has a young star cluster at the centre of it. Four nebulae are listed in the NGC catalogue in the vicinity of the Rosette nebula although it is hard to determine precisely which parts of the Rosette Nebula they are meant to represent. They were all discovered visually in the eighteeth and nineteeth centuries before astronomers realised that there is only one nebula here. NGC 2239, for example seems to refer to a part of the nebula around the star 12 Monocerotis. The 'sizes' in this list refer to the entire nebula and not these individual parts. The only star cluster which is definitely associated with the Rosette nebula is NGC 2244 at the centre of the nebula. This cluster was discovered by William Herschel in 1784. NGC 2186 is also in this list because although it is 5 degrees (and 400 light years) from Rosette nebula it is at the same distance from us. 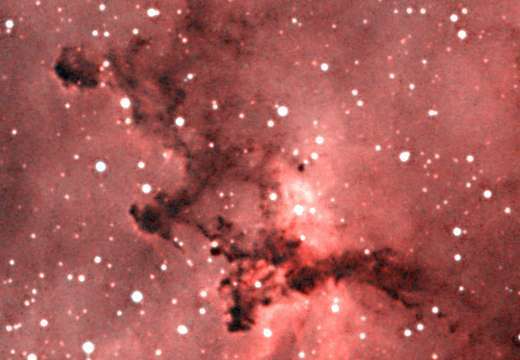 NGC 2252 at the northwest of the nebula may also be part of the nebula, although it has an unknown distance. NGC 2252     06 34.8  +05 22  206.2  -1.3    18'       ?        ? Column 1: The standard catalogue name for the cluster. Column 4: Angular size of the cluster in arcminutes. Column 5: Distance to the cluster. Column 6: Approximate age of the cluster in millions of years. Column 7: Alternative name of the cluster. visible open clusters and candidates. Astron and Astrophys, 389, 871. 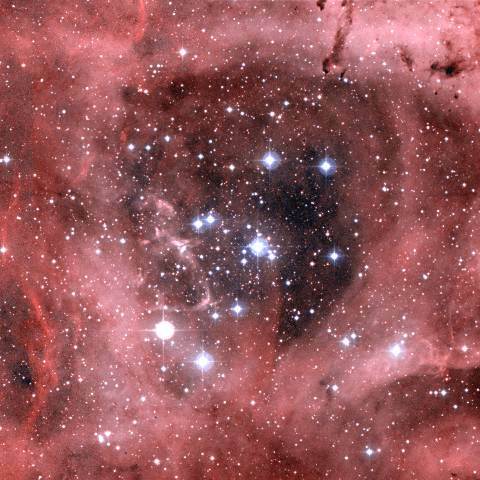 Below is a map of the Rosette Nebula. The principal parts of this nebula are labelled and the locations of the two main star clusters are also marked. Note also that the Rosette Nebula lies at the right end of a much fainter emission nebula that extends across three degrees of the sky. The distance to the Rosette nebula is well known because there is a star cluster at the centre of the Rosette nebula which makes determining the distance much easier. The Rosette nebula is 4700 light years away and lies in the near side of the Perseus Arm. 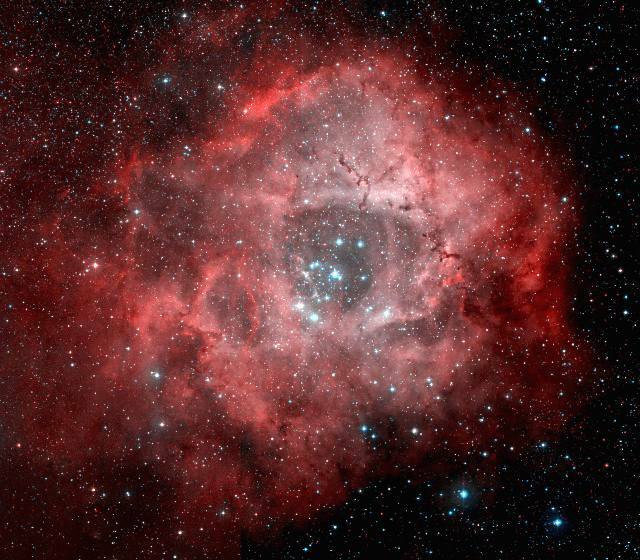 At the centre of the Rosette nebula is the NGC 2244 cluster. This young, bright cluster is responsible for creating the hole at the centre of the nebula. The intense radiation from the stars has blasted away the gas around them. This picture has a diameter of about 40 light years. This close-up view of part of the Rosette nebula reveals large clumps of dust. This picture has a width of approximately 10 light years.